As peonies are the very popular fragrant flower of May, stock provides the perfect natural perfume for April. It comes off as being both classy and countryish–a flower “for all seasons” (to paraphrase). We have an excellent stock of stock in our shop in the popular colors of white, purple, lavender and pink. 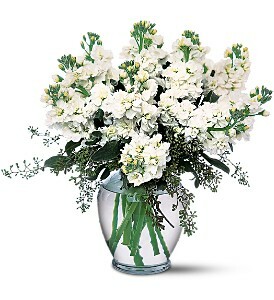 We encourage customers and potential customers to take advantage and order these wonderfully scented flowers. Call us and we can put together a custom arrangement for you.